Since 1920 the Communist Party has been at the forefront of working class struggle in Britain. At its peak our party had 60,000 members and two Members of Parliament. Almost ninety years since its formation the Communist Party still plays a leading role in the fight to build a better, socialist, world. You can help rebuild the party and build a better future. The following is an extract from a speech by Bill Greenshields, Communist Party Chair. The Capitalist system is in crisis. The ruling class are engaged not just in the day to day class struggle, but have launched a class war. We advocate a broad anti-monopoly alliance, in which initiatives like the People’s Charter and People’s Assemblies are important, in winning a substantial and sustained shift to the left in the labour movement. This is what our party programme refers to as “the first stage of the revolutionary process in Britain”. We are organising for coordinated and generalised industrial action, and widespread civil disobedience in order to make the country ungovernable, bring down the government and begin the struggle for the election of a progressive left government, which will mark the “second stage”. 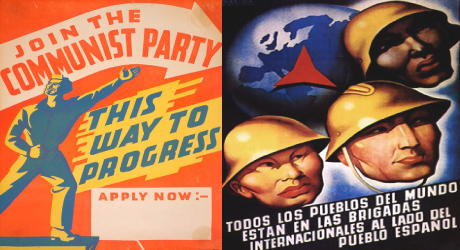 There never was a “post war consensus” – just a powerful working class and trade union movement, a strong reforming Labour Party, a Communist Party at the height of its membership, and a Socialist reality in the world. The ruling class were on the back foot. They retreated – but only temporarily. From the 80s on they have been following a strategic path of undermining and destroying working class organisation. If the movement continues to resist and increases that resistance, but has no strategy, or even intent, of winning, we put ourselves and our class in extreme jeopardy. The response of a capitalist class facing economic and political crisis, continuing working class resistance and international competition from other capitalists, is to up their game to enforce their power. It is a recipe for fascism and war. We have to have a clear understanding in the Party of these issues. We need structured and disciplined study and cadre development at all levels. It means planned, prioritised and systematic work with our strategic aims in mind. It means pride in Party membership, and in promoting the Party’s positions and policies. There is, as they say, no alternative. Be the first to comment on "Build the Party"